Who is Vinet America? What does Vinet America do? Vinet America is a leading provider of third generation technology solutions for the travel industry. Established in 2000 by a group of experts from both IT and travel industries, Vinet America specializes in the development of Internet based software solutions for tour operators, golf operators, airfare consolidators, hotel chains and inbound operators. Vinet America is specialized in developing technologically complex and challenging system solutions especially addressing the growing needs of travel companies for an Internet based, comprehensive software. Integration is the key issue in Vinet America’s technology; travel companies tired of old systems, which obliges them for repetitive, inefficient efforts, are now enjoying the efficiency of Internet based software from Vinet America that enables them with the total integration. Common database, which can be simultaneously utilized from different geographical locations, enables call centers, travel agents, in-house reservations and operations departments, destination offices, different levels of management, financial departments work seamlessly in harmony via Internet, wireless communication environment. Internet Front-end; what is it? Regardless of the several debates of different kinds, GDSs are still the major players in travel industry. Especially when an airline reservation is required to be picked amongst several alternatives of different careers, CRS is often the only convenient alternative. Vinet America specializes in transforming the “green screen” into DIIF by means of several unique interfacing and messaging processes. 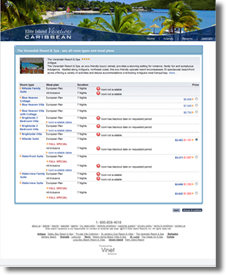 Additionally as the latest development Vinet America introduced CRS integration for live availability and reservation of the air portion of the vacation packages; customers, travel agents or any user can now enjoy the convenience of live availability of flight portion while other segments of the vacation packages are controlled from own database.